Last night, Gonzaga basketball made its debut as the subject of Gonzaga: March to Madness, and if you missed it, or don't have HBO, let's bring you up to speed. So the show, which airs on HBO at 10 pm for the next four Tuesdays, got off to a face-in-palm start when the lead-in announcer said, "And now, GonZOGa, the March to Madness." Really? You're going to devote five segments of programming to a basketball team, but you're not going to learn how to pronounce it? When the actual show began, we were out in the wilds somewhere outside of Spokane, assumedly upon the expansive stretch of land that Coach Mark Few calls home. He talked about the beauty of the area, and the beauty of basketball, before getting in his car and heading to Spokane. In Spokane, of course, the shots were of railroad tracks, bridges and defunct grain silos. I expected a hobo with one of those knapsacks tied to a stick eating beans out of a can to come pacing through the frame. But then we eventually got to the idyllic Gonzaga campus and the immaculate interior of McCarthey Athletic Center where the Zags were out on the court in the middle of practice. And it was last week's practice, which was a bit of a surprise. Maybe I was the only one who assumed that it would begin in the early stages of the season, given that the crews were rumored to have followed the team across the world in their early-season adventures. Instead, we saw the Zags prepping for a trip to Portland before jetting off to a nationally televised showdown with SMU. For deep Zag fans, it was a whole lot of what you already know — Karnowski is injured, they've had some bad losses, but are still playing solid basketball. If you were waiting for some backstory, that was about all you got. But maybe in an upcoming episode they'll explain how Gonzaga became, well, Gonzaga. But as far as behind the scenes stuff goes, we weren't disappointed. And I'll just get it out of the way — the Zags' travel accommodations are pretty damn sweet. I'm pretty sure they got off a charter bus on the freaking runway and walked directly into a charted jet. Anybody else catch that? 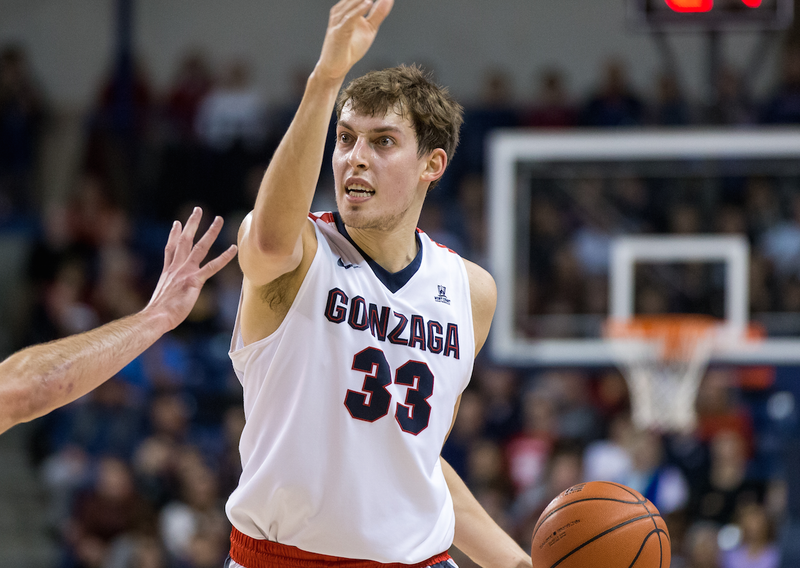 We also saw Kyle Wiltjer spend an evening at his folks' home in Portland the night before the showdown with the Pilots. We didn't learn a whole lot about him, other than that he won a National Championship at Kentucky before transferring out West, which you probably already knew. But when his dad jockeyed the car around to illuminate the driveway hoop with the headlights, it was TV gold. Then, on the hoop he grew up on, Wiltjer proceeded to drain a long string of deep shots... and you couldn't but help that he would have saved some of that magic for Dallas. So the Zags romp Portland and then head to SMU, where former President George W. Bush watched the Zags lose a game that saw Wiltjer miss 15 of the 17 shots he tossed up. There was no driveway magic to be found. Perhaps the most interesting moment of this debut episode came in the locker room when the players sat in silence, heads to the floor until Few came in and gave them a talk about what went wrong and basically took the blame for the loss. Next week, the promo told us, the series watches the Zags prepare for their rematch with St. Mary's.